Chandler Pegg debuted in win over Alfreton! There were many highlights in our 4-1 home victory against Alfreton Town on Easter Monday. However, there was a particularly special moment for all connected with our Academy set up, as current U16 squad member Chandler Pegg made his first team debut at 16 years and 2 days old, becoming the youngest first team player in Lambs history. Pegg, who is a current year 11 student at Landau Forte Academy, was also an unused substitute on his 16th birthday away against Bradford Park Avenue. Manager Andy Morrell said "“He has been absolutely terrific. All the lads were like 'Who is this character?' and a few weeks later they found out he was 15 turning 16 and they couldn't believe it. He has a good stature about him, a good attitude and he has taken it all in his stride." 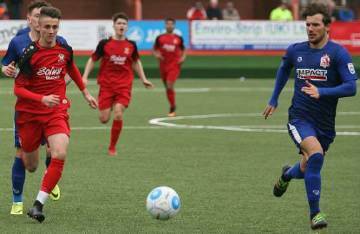 Morrell continued “I bet he was nervous going on against Alfreton but it will have done him the world of good and it's great for us. I know there's nothing on the game but we have to be brave enough to give them a go and see. He has every chance if he keeps his feet on the ground. He has something." The game was the 30th consecutive first team fixture where a youth product featured in the squad, as Pegg was joined by ex U21 player Dan Jezeph who started. We are always seeking the next generation of Academy talent, and current U13, U14, and U15 players are invited to trial this Friday (April 21st). Please email development@thelambs.co.uk to register.